Pittsburgh’s big dig | Where have the days gone? 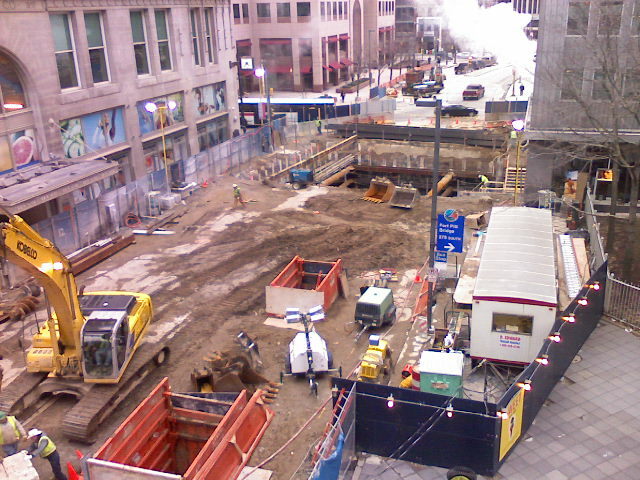 Actually, this is the less interesting end of the tunnel, it just happened that I was downtown for a seminar, and the garage I parked in had a great view of the hole in the ground. On the North Shore end, the TBM (Tunnel Boring Machine, brought over from Germany/Switzerland) has recently entered the earth, and will begin its digging soon. We had bid on making the precast tunnel sections, but they ended up not being able use our price and payment terms, which we knew better than to budge on, so hopefully the company that ended up with the job will be able to make it through. But it's interesting to watch. Here's a map of what they're doing. The basic idea is to connect the existing subway system (tiny as it is) to the North Shore, where PNC Park and Heinz Field are (and some new hotels, and theoretically a casino coming). And then I see by the map that they feel you can somehow get to the airport from there. That's a little ambitious! But I do think the ultimate goal is not just to get to someplace you can as easily walk across a bridge to, but to open up the North Hills to mass transit like the South Hills has had for decades. There was much debate about whether it couldn't be done on one of the existing bridges, but then they would've had to figure out where in downtown (which is very tight) the subway could emerge from underground. This way, it doesn't emerge till it gets across the river, where there's more room. They're putting in a tunnel under the river? Didn't know Pittsburgh was a digging. Why not a bridge instead?